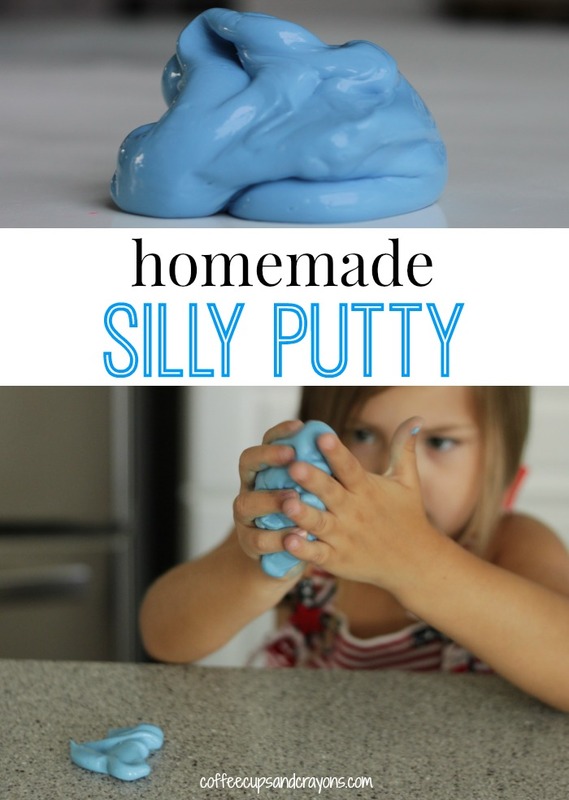 Homemade silly putty is both a great kids activity and a science project! After playing with silly putty at engineering camp this week my kids wanted to play with it at home too. We decided to make some homemade silly putty using items we already had at home. It was a great way to extend their learning and play! Making silly putty turned out to be a great way to practice thinking like a scientist and using our problem solving skills. Our first version didn’t turn out very silly putty-ish even though we used a recipe we’ve used many time before. It was a great chance for the kids to experiment and figure out how to fix it. 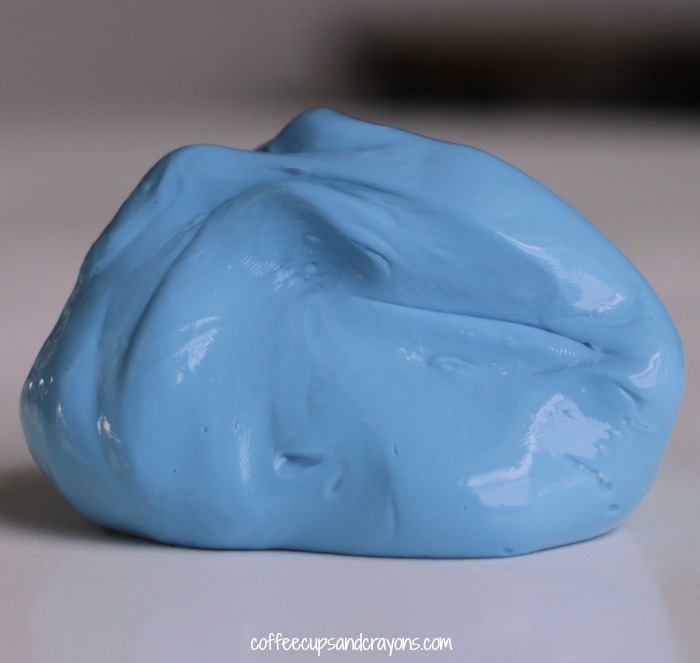 The basic silly putty recipe is 2 parts glue and 1 part liquid starch. We started with 4 oz of glue and blue food coloring. Then we added 2 oz of the liquid starch. We mixed it together with a wooden spoon. Once it thickened we then kneaded it for 5 minutes–which is a lot longer than it seems–but we weren’t happy with the consistency. We decided to let it sit for a little bit and then after about 10 minutes we tried kneading it again. This time it was more silly putty-ish. The kids had fun bouncing and cutting and squishing the silly putty, but were disappointed to see that it wouldn’t make prints like the store bought kind does. We’ll have to keep working on it! Join me and Erica from What Do We Do All Day? 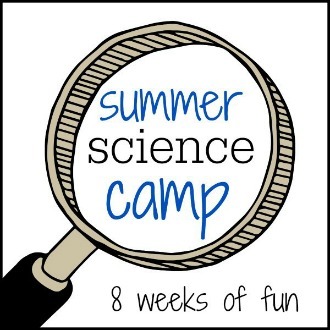 each Thursday this summer for a free Summer Science Camp. We are sharing classic science experiments that your kids will love! Head over to see the Balloon Rockets they made this week–I can’t wait to try them! Don’t let the fun and discovery stop there! 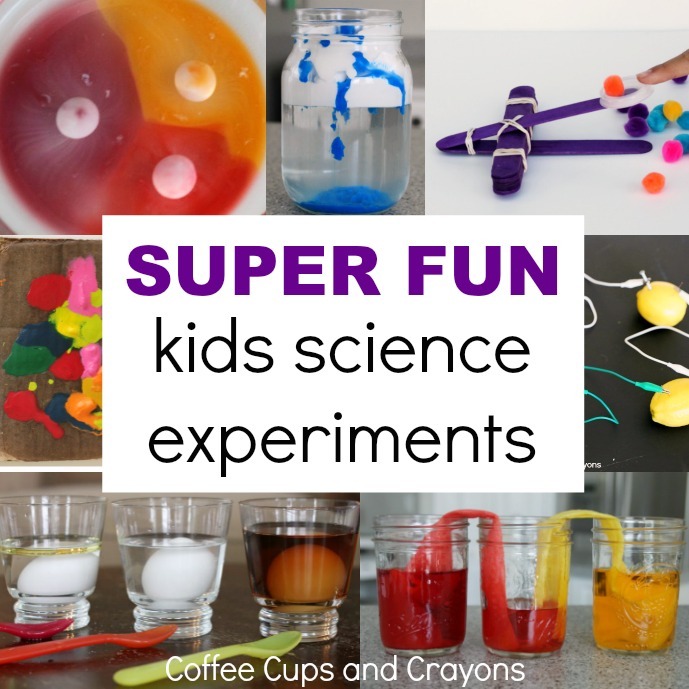 We have TONS of science experiments your kids will love on our Super Cool Science Experiments for Kids page! What Do Phonics, Phonemic Awareness and Decoding Mean? I totally love this! We have to do it!! Eeeeek! Those balloon rockets you did are the COOLEST!!!!! That was the exact same situation here!!! Have you tried making it with borax? Worked really well for us. Same parts glue and water and stir and add food coloring then in separate cup mix 1/2 cup warm water and 1/2 teaspoon borax for ever bottle of glue and mix it in. I’m going to try like this and see which I like better. Not sure if this does the same but it is really neat when you add the water borax mix! Hi Camilla! This recipe calls for liquid starch which is different from borax. Are you able to get that in Germany? The brand I have here is Liquid Flo. For slime you can sometimes use laundry detergent. You’d have to do a search to find out which brand works the best. For silly putty which is a little bit thicker you can use borax which is also found in the laundry section. Instead of the liquid starch add 1/2 teaspoon of borax soap to a 1/4 cup of warm water. Stir together and then slowly pour into the glue while stirring. You’ll want a grown up to work with the borax until it has been completely mixed in. Liquid starch is ok for kids to play with???! As a polymer it’s safe for them to play with, but NOT eat!!! If you have young ones that still put things in their mouth you’d want to save this idea for when they’re older. I just made this and LOVE it! How did you store this after play? Just an air tight container or plastic bag? How long would you say it lasted? Thanks for this recipe! Yay! We stored ours in an air tight container. Ours lasted a couple weeks until they took it outside–may have even lasted longer! We stored ours in a zip lock bag and it lasted for around a month until it started to get a little soiled. We found the borax worked better in the mixture. Yes, the borax does make it thicker! Ours is still really slimy. We didn’t have staflo but used liquid starch. Does the brand matter? We have been kneading for a while now and it isn’t hardening up. Hmmm…I wouldn’t think brand would matter, but possibly. Let it sit out for awhile and then knead again. You can also try adding a little more glue and see if that works. Did you add coloring? Yes, that should be the same thing! Hi I’m in the UK too, what starch product would you use? I’ve not seen liquid starch! We have corn starch powder…. I’ve heard that you can use laundry detergent but haven’t tried it. This post http://www.funathomewithkids.com/2014/07/make-slime-with-laundry-detergent.html suggests Almat Laundry Gel Bio. Do you have that? Oh no!!!! Good to know! Thanks for the tip!!! Silly putty is a lot of fun. For a follow up activity why not read my book “Gingerbread Aliens” with the kids and see what happens when silly putty accidentally gets mixed up with the cooking dough? A hilarious reading adventure for children of all ages. I don’t have little ones but, know someone who does. Passing this on & pinning. Thanks for the diy! Oh no! Try this post from Asia at Fun at Home with Kids. You’ll have to adjust the amounts a little to make a putty vs a slime. I’ll keep looking to see if I find anything else! Really? What a bummer! I used to love to do that! FYI your link to the elmer glue goes to the starch link. This is probably waaay too late, but in reply to your question Lynn from Australia- you can find borax at Bunnings, in the detergent/cleaner section. I’m in Australia too(WA) and if it’s well worth making-sooo much fun! Awesome Raisingstars!!!!! Thanks for helping!!!! Usually in our kitchen or backyard!